In ActivePresenter 7, events and actions come with objects (e.g. shape, text box, question) and slides. 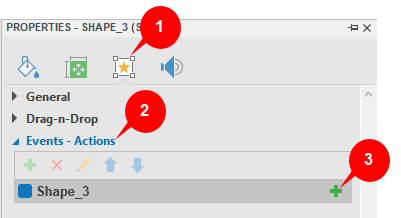 For any kind of these objects, you can add events (for example, “when the mouse rolls over this shape”), and add actions to be taken as responses to those events (for example, “display the hint message”). Events – Actions is useful especially in creating quizzes, games or courses that usually require a high level of interactions. In older versions of ActivePresenter, interactions are managed in the Event Editor dialog. From version 7, the Event Editor no longer exists. Instead, you can set up and manage interactions in the Interactivity tab of the Properties pane. 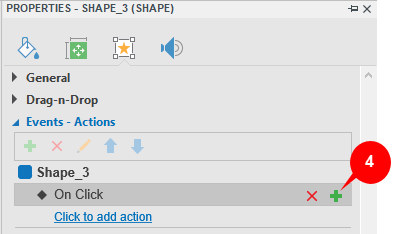 On Click: Occur when users click these objects. On Accept: Occur when any accepted. On Reject: Occur when any rejected Drag Source is dropped onto the Drop Area/Drop Target. On Correct: Occur when users give a correct response. On Incorrect: Occur when users give an incorrect response. On Complete: Occur when the question is answered or the text box is filled. It is only available when the mode of the question or text box is survey. On Incomplete: Occur when the answer is incomplete. On Timeout: Occur when viewers don’t respond within the specified time. Go to Slide: Go to a specific slide. Go Forward: Go forward by a specified number of slides. Show Object: Show different types of objects such as shapes, images, audio, etc. 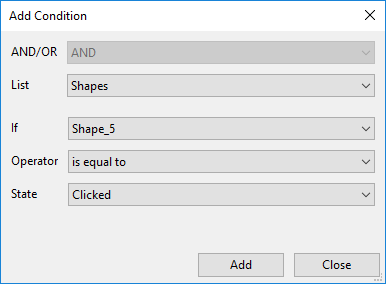 Change Object State: Change the display state of an object. Start Timeline: Start the playback of the target timeline. This is important when your project has added timelines and you want to use actions to call them. Note: Each object can have more than one event and each event can have more than one action. Events vary from object to object, which means different types of object can have different types of event. If you want to know more about each type of events and actions in ActivePresenter 7, feel free to take a look at page 290 in the PDF User Manual. In general, the procedure of working with events – actions is to add events to objects/slides, then add actions to events, and finally and optionally, add conditions to actions. Let’s get to know in details. Step 1: Select the object or slide that you want to add events. You cannot add events to multiple objects at once. Step 2: Open the Interactivity tab (1) in the Properties pane. Step 3: Access the Events – Actions section (2). Step 4: Hover the mouse over the object title and click the Add Event button (3). Then, select one event from the pop-up menu. Step 1: Hover the mouse over the event entry and click the Add Action button (4). Step 2: Select an action from the action list that pops up. Repeat the procedure to add more actions if you want. Note: ActivePresenter 7 allows you to add more than one action to an event. In that case, actions will take place in the order that you insert. To change the order of an action, select it and click the Move Action Up button or Move Action Down button to bring an action up or down one level respectively. Step 3: After selecting an action, the action entry will appear below the event entry. You can define the further properties of the action. Just click the action entry (Click to add action) and take further steps depending on the type of actions you are adding. 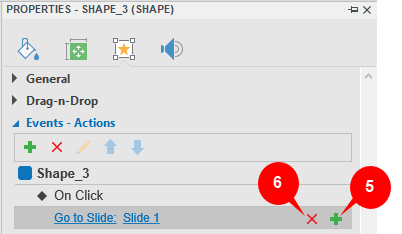 For example, if you add Go to Slide action, you have to specify the slide that the presentation will go to. On the other hand, if you add Show Object action, specifying the object along with its entrance/exit effect is the next step. ActivePresenter allows you to set specified conditions for a given action. When you set conditions for an action, then the action can only be played if those predefined conditions are met. To add conditions to actions, hover the mouse over the action entry and click the Add Condition button (5). This opens the Add Condition dialog. The content of this dialog may vary differently. It depends on which type of objects you are working with. And/Or: Use this to combine multiple conditions in an action. List: The type of object to be compared in a condition. Operator: The logical operator which is used to compare. State: The state of the shape which the current state of the shape is compared with. Type: Select to compare a variable with a variable or a value. Value: Set the value to compare the variable with. Tip: You can add extra functionality to actions with variables. For more details, see Variables. In order to delete any event or action, just hover the mouse over that event/action entry and click the Delete Event/Action button (6). That’s how to add events – actions to objects in ActivePresenter 7. Hope that you will find it helpful in creating effective interactive contents. Feel free to contact us if you need any help.